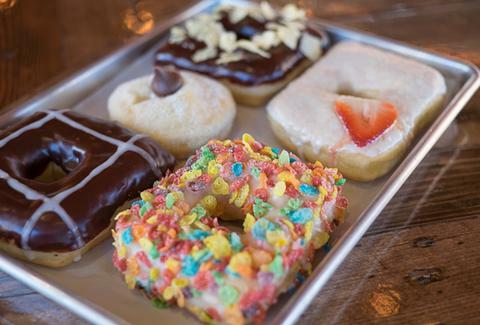 Fancy doughnuts have been making a splash in San Diego for some time, causing San Diego residents to ALSO make bigger splashes. 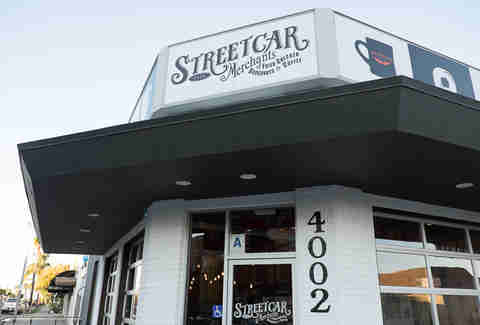 However, a new North Park shop’s unique take on the beloved handheld treat is especially worth seeking out, largely when you consider its full, highly informational name: StreetCar Merchants of Fried Chicken, Doughnuts & Coffee. Most doughnut shops sell a selection of crumbly cake and springy yeast doughnuts. Not here. 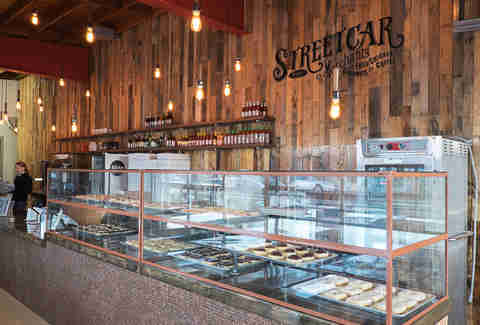 Instead, the display case is stocked with brioche doughnuts, made from butter-rich dough that takes two full days to come together. The result is dense, squishy, and flavorful doughnuts that want to be inside you. 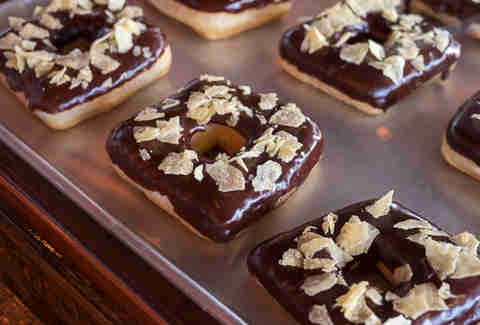 If these square-shaped doughnuts wore pants, they’d shop for them in the big & tall section. 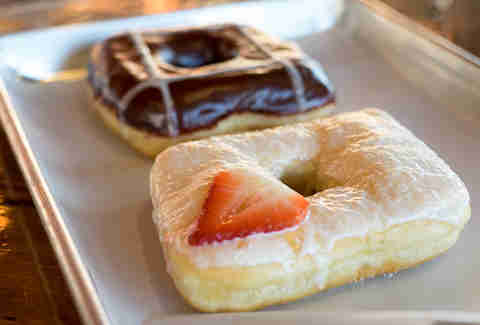 Yes, you could technically split one doughnut between two people, but you won’t want to. The ideal doughnut-to-patron ratio is 2:1. Arrive hungry. Early birds are rewarded with the best selection, but even if you roll in at 2 or 3pm, co-owner RaVae Smith says there will still be at least half a dozen varieties available, so go ahead and sleep in. Love a good, old-fashioned doughnut? 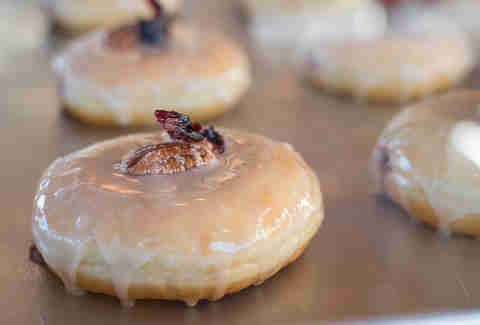 Classics like cinnamon sugar, Boston cream, and vanilla glazed are well-represented, along with imaginative creations like eggnog, horchata, and whiskey pecan with blue hibiscus jam filling, whiskey glaze, candied hibiscus flowers & pecan pieces. Most classics are $2 apiece, while the more envelope-pushing options range from $3-$4. Mary’s free-range, organic, air-chilled chickens are available in three delicious preparations: Southern (traditional), Nashville-style (hot and spicy), and Korean (twice-fried). Add a waffle or two to double your pleasure. Just be prepared to wait; chickens are cooked to order one at a time, so it can take 30 minutes or more to get your bird. On the plus side, you can pass the time with a doughnut. 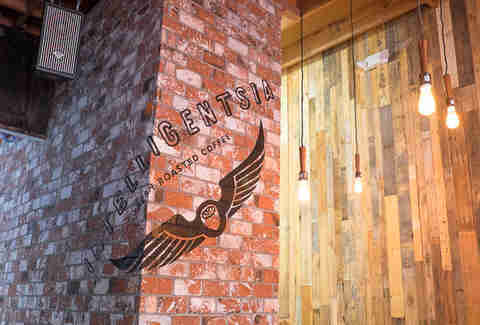 Pour overs, espresso beverages, and straight-up coffee brewed from fresh roasted Intelligentsia beans go great with a doughnut any time of day. 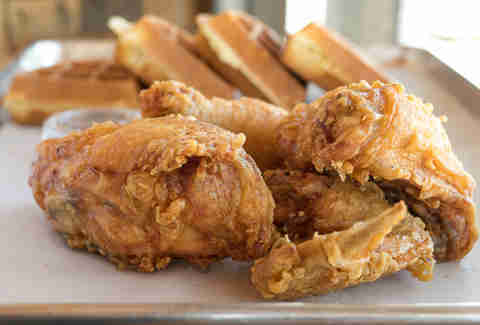 For your fried chicken pairing pleasure, the shop also stocks a selection of craft sodas. Co-owner Ron Suel says he’ll be adding six beer taps of Green Flash and Alpine Beer Company brews within the next month, along with a separate menu of hot and fresh made-to-order doughnuts in February. The team is also working on perfecting French crullers and finalizing a late-night menu with crave-worthy munchies like popcorn shrimp po' boys, fried pickles, and doughnut grilled cheese sandwiches. Yes, doughnut grilled cheese sandwiches.